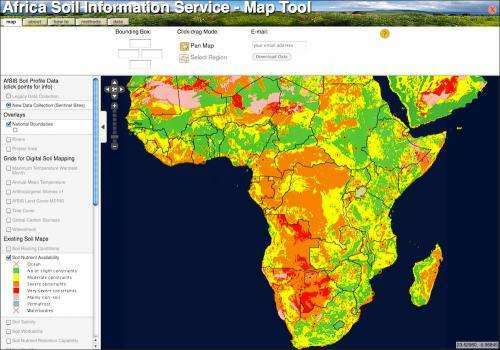 The Africa Soil Information Service (AfSIS) Online Map Tool is an interactive mapping application that can display more than 30 maps of soil and related environmental characteristics for the continent of Africa. The tool creates a clickable map that lets users zoom in and examine soil characteristics from existing, legacy soil maps and data as well as a new collection of soil samples gathered by AfSIS over the past four years. The map shown above visualizes information about soil nutrient availability throughout Africa using this online tool. Nutrient availability is a critical determinant of soil suitability for growing crops, along with other factors such as rainfall, potential for irrigation, and land surface temperature. 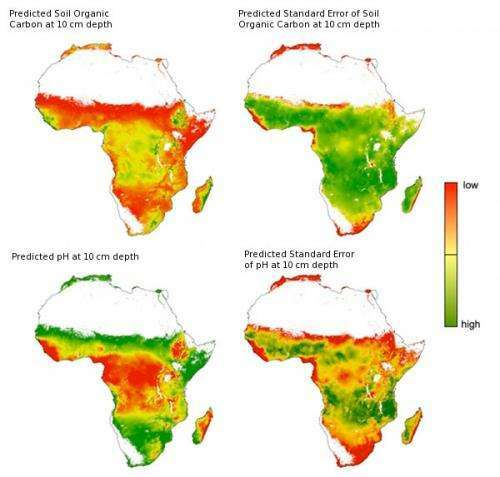 The map assesses soil quality across the African continent based on the potential for growing maize, determined here by specific constraints, as shown in the legend. ( Maize was chosen because of its global importance and widespread distribution.) It was created by selecting the new data collection ("sentinel sites," which are the locations of new soil sampling field campaigns) and applying the national boundaries overlay. The underlying data set was developed for the Global Agro-ecological Zones Assessment for Agriculture 2008 by the International Institute for Applied Systems Analysis (IIASA) and the Food and Agricultural Organization of the United Nations (FAO). Looking at the map, we can see that the greatest constraints to soil fertility (the orange and red areas) are found in Central Africa, the Congo, and Botswana in Southern Africa. The Congo is one of the most heavily forested areas on the continent, illustrating that this approach may characterize very lush areas as only semi-fertile because they are not well-suited for growing maize. The fewest constraints are seen in East and Southern Africa (the green and yellow areas). Interestingly, there are also relatively few constraints in the Sahara Desert. This is because the constraints are derived from laboratory measurements of specific soil properties at a given location (for example, Texture/Structure, Organic Carbon, pH and Total Exchangeable Bases) and do not include climatic constraints such as low rainfall and high temperature. Visualizing the data makes this information accessible and helps identify "yield gaps"—the difference in productivity between the currently harvested yield and what might be possible with different management practices. Here, new digital soil mapping techniques were used to predict key soil properties such as soil organic carbon (SOC) and pH for the vegetated land surface of Africa, based on more than 10,000 legacy profile measurements and remote sensing data. Uncertainty maps such as the ones on the right help characterize the accuracy of the predictions, making the maps more useful in decisions about where to focus new sampling efforts. The sentinel sites (represented by the black dots) show where new soil and ecosystem data have been gathered over the past four years by AfSIS field survey teams. This new data collection includes more than 19,000 new soil samples covering the major ecological zones of the African continent. Analysis of these soil samples is currently in progress at the Soil-Plant Spectral Diagnostics Laboratory of the World Agroforestry Centre (ICRAF) in Nairobi, Kenya and the geo-referenced samples are being archived at ICRAF for future comparative studies. Data from these analyses will be uploaded to the Mapper as they are made publicly available. These efforts combine laboratory analysis and expert knowledge, and in addition use remote sensing imagery to assist in developing statistical models to predict soil properties in areas where ground samples have not been taken, providing more information at higher resolution than previous soil maps. The maps to the right, for example, illustrate predicted soil functional properties such as soil organic carbon (SOC) and acidity (pH) levels. Soil to the depth of 10 centimeters is shown but other depths are available. For each of these properties and depths, maps of the associated standard error (SE) of the predictions are also being developed. These "uncertainty" maps help users understand the limitations of mapping soil constraints over large areas with limited data. Data such as these will continue to be added to the repository, and will be made accessible through the AfSIS Online Map Tool.